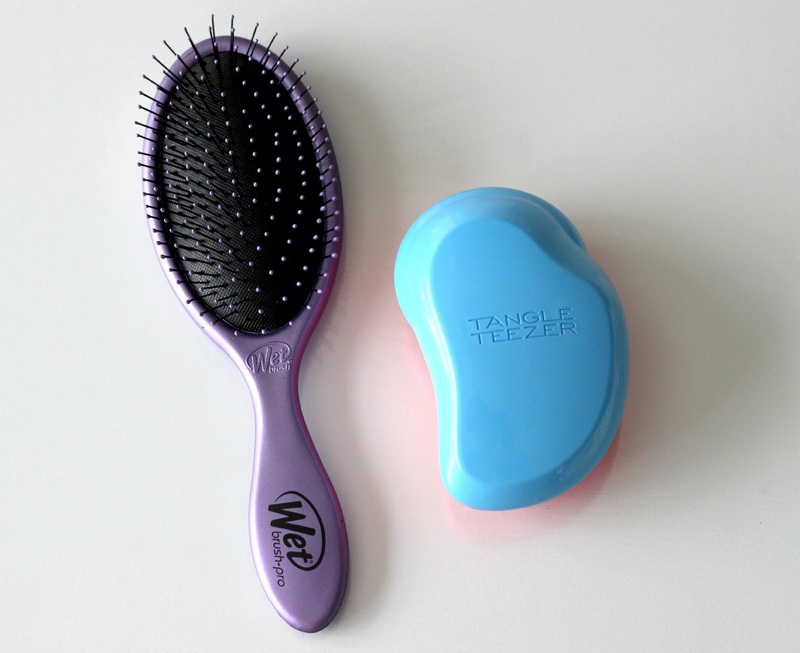 The Wet Brush vs Tangle Teezer | Which One Works Best? I have a confession to make: I don't brush my hair on the daily. You might be thinking, how in the world do you not brush your hair every day? Isn't it a necessary step in your (at least) morning routine? Well, with my hair being wavy, using the average brush practically turns it into an afro (okay slightly exaggerating here, but hear me out). Instead, I've resorted to using wide tooth combs because they do not disturb my hair shape nearly as much. Seeing as my relationship with brushes has been quite distant, I thought it would be fun to step out of my comfort zone and try out and compare two very talked about, not your average hair detangling tools: The Wet Brush* and the Tangle Teezer*. If you're on the fence about which one to get, this one's for you! The Original Tangle Teezer is quite funky looking and comes in heaps of fun colours, like this Blue & Pink one. 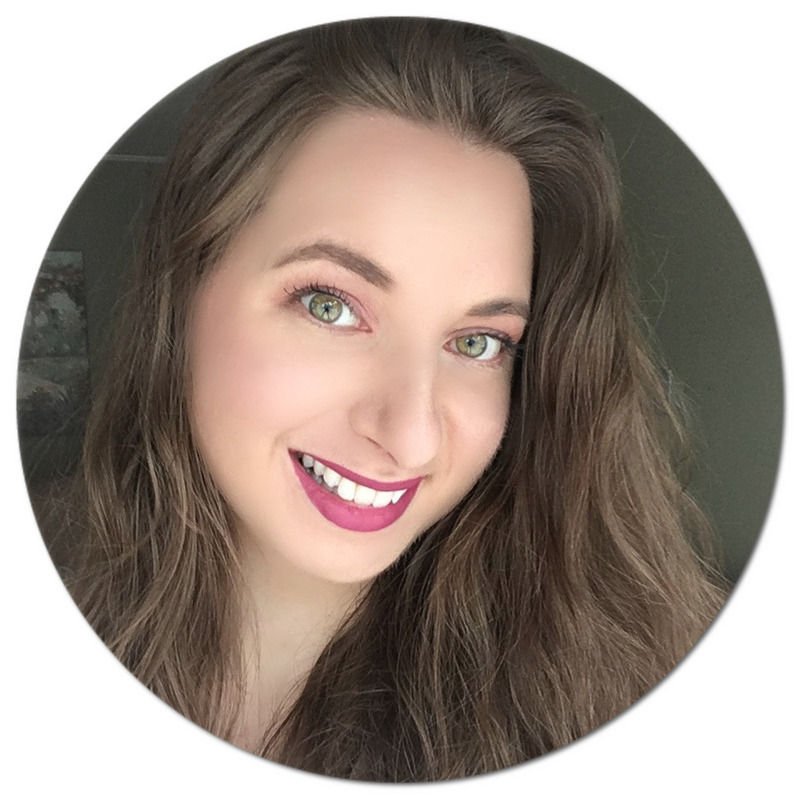 The brand also makes variations of the product, such as the Compact Styler which is less bulky, more travel friendly and comes with a removable cover (reviewed here). Since my hair is on the thicker side, I find the Tangle Teezer takes a bit more work to brush knots out than The Wet Brush. This is why I find the Tangle Teezer to be a better option for fine and straight hair. Since the bristles are not as long and closer together, they are better at detangling thinner strands but at the same time remove a lot more of the natural waves I have going on. Personally, I also have to brush on top and under my hair to smooth it out perfectly. Mind you, it's a great detangler even on wet hair, but takes a bit more time and effort to work with. The Wet Brush I find is easier to use on thicker hair. It resembles the average hair brush but is designed to be super gentle even on wet hair by removing big knots with ease. 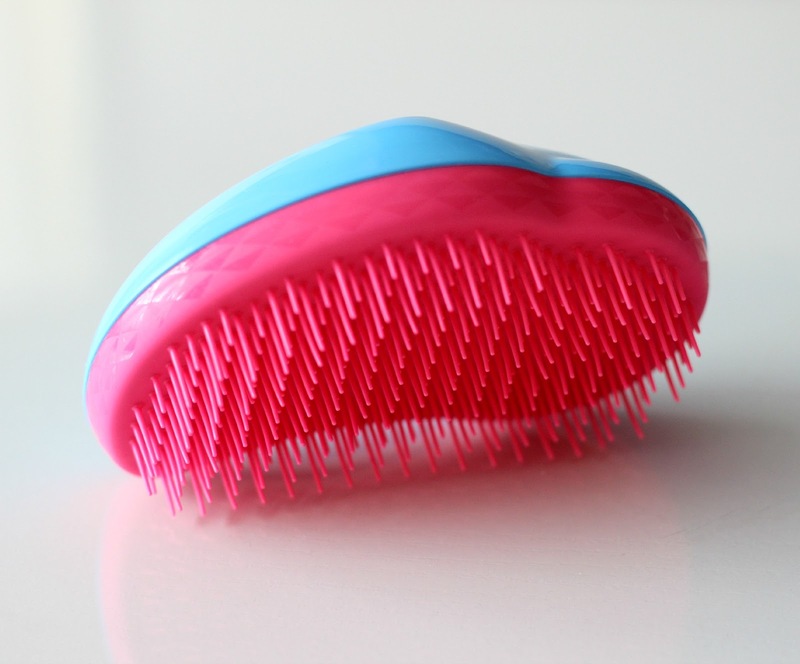 The bristles are more flexible and longer meaning it grabs the entire strand when sectioned off so I don't have to brush it through nearly as much as The Tangle Teezer. The tips are also rounded meaning it does not feel like it is scratching the scalp. I find it is more comfortable to grip since my hand does not get in the way. Since the bristles are distanced further apart, it does not stay stuck at a knot and is much easier to clean as well. I find it more pain free than the Tangle Teezer for this reason too. 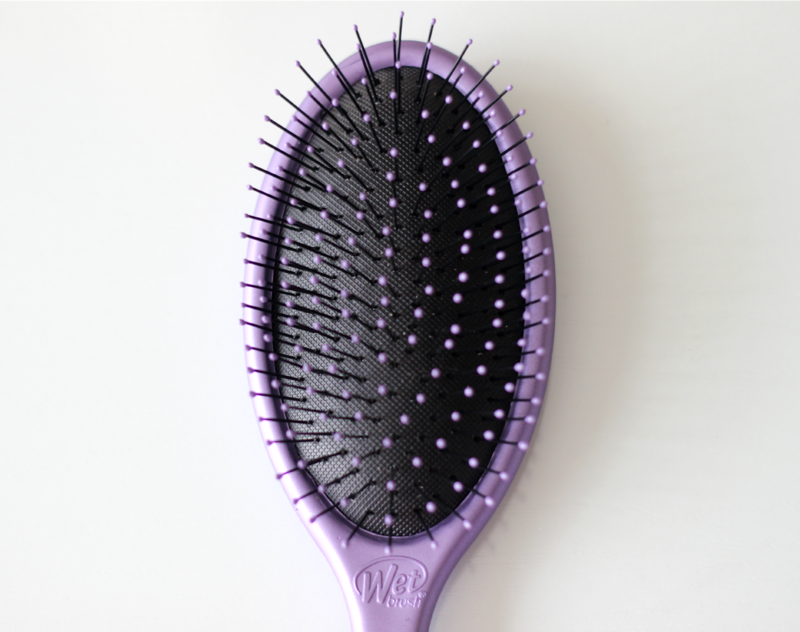 The Wet Brush also comes in a few colours like this Purple one, so that is always nice! From my own experience, I find that taking your hair type into consideration is key when determining which brush to get. Fine, straight, knotty hair? The Tangle Teezer is for you. Thicker hair with dimension to it? Go for The Wet Brush. Have you tried any of these? Leave your thoughts in the comments below! The wet brush looks perfect for my hair type, i use a boars head brush right now, i have been trying it out for about a week now, and i am still debating weather it is for me or not. I've been really curious about the wet brush, but it sounds like my Tangle Teezer is more appropriate for my hair type. This was a great comparison! I haven't tried any of these two brushes yet. Been curious about the Tangle Teezer because I read so many great reviews about it. But the wet brush sounds much more appropriate for me as my hair is pretty thick. I've been wanting to try the Tangle Teezer cause I've heard so many rave reviews about it, but I have long wavy/curly hair so I don't think it would be all that good for me. I also use a long-toothed comb on the daily, so the Wet Brush sounds like it would be better for me. These both look great. I haven't tried either, but am really interested in the wet brish. I think it would be a great brush. My hair is super thick. I think the wet brush would be great! When my hair is flat ironed I could use these but on thick curly hair...nope! lol I have heard a lot about the tangle teezer but I've never tried it. Like you I don't brush my hair every day, sometimes I finger comb but I try to prevent damage and breakage any way I can. Sometimes after washing & conditioning I will detangle with a wide tooth comb in the shower which helps since I have very long, thick hair. So exciting that you saw me in Avon, thanks for letting me know, it has pretty good circulation! Have a fabulous weekend. wet brush is AMAZE balls! I love it ! :) my hair and my daughter's hair gets super tanglly ! ! so thank god for this thing! I want to try the wet brush. I've already tried the tangle teaser. I've been using the Tangle Teezer for a few years now and it works pretty well but my hair is pretty thick and when it gets those really rat's nest knots...yeah, that brush is not going to work. So maybe I'll try the Wet Brush! This is exactly the post I needed ! Thanks Natalie ! I love the Wet Brush! I have two! I've never tried the other brush. I havent tried both. But this two things are interesting... a must try thing for a woman who loves to have a healthy hair. I haven't tried either.. but going my looks.. I don't think that I could deal with the shape of the Tangle Teezer. I feel like I need a brush handle to work with! I like that pink thing. :) looks like it would get all the knots out of my hair! I don't brush my hair every day either. The only times I could brush my hair and not have it look like a disaster was when I had it all one length and about waist-length (which was about thirty years ago). With the curls, it is easier to keep it in layers and not as long. I find a pick or a wide-tooth comb to work the best. Conair has a funny-shaped wide-tooth comb that works the best for me. Thank you for sharing your experiences. You've saved me the time and money I would have used exploring different options that are available now and weren't ten or fifteen years ago. I actually use the tangle teezer. My hair gets really messy and there is sometime knots in them, I do not know how I get them.